Baldurs Gate is still a game thats well worth playing, but the Enhanced Edition isnt the version wed recommend. Baldur's Gate is still brilliant. I'll say that now before your eyes drift over to that number at the bottom. Fourteen years on, BioWare's first RPG – an isometric, text-heavy epic with sprites for graphics and an almost bewildering 2nd Edition Advanced Dungeons and Dragons ruleset – still provides an expansive and enjoyable experience. The plot weaves together a tale of your character's dangerous journey from the safety of his secluded home, an iron shortage that threatens to flare tensions with neighbouring regions, and a shadowy figure in armour who screams Chaotic Evil. Despite the drama, it still gels nicely with the (sometimes knowingly silly) high fantasy of the Forgotten Realms D&D setting. It has its idiosyncrasies. The now obligatory BioWare morality system makes an early appearance, but the penalties for a low reputation – restrictive shop prices and hostile guards – make exercising your inner panto villain all but impossible. And there's the combat, which now just looks plain weird – characters stand and slash away at each other, waiting for the invisible dice to roll high enough to register a hit. 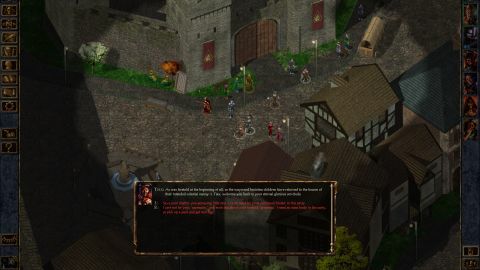 Baldur's Gate is no longer “as clean as an Elven arse”, as Winthrop from the Candlekeep Inn would say, but it is still a deft marriage between the complex RPG mechanics and engaging writing. The good news is that this Enhanced Edition is the same great game. Paradoxically, that's also it's biggest failing. It does bring some additions, and they fit neatly into the game. Because the engine runs with the Baldur's Gate 2 improvements, each of the three new potential party members use a specialist subclass. There's Neera the Wild Mage, Rasaad the Monk and Dorn the Blackguard, all with a unique set of encounters that relate to their backstory, and all are natural enough that a newcomer wouldn't notice the insertion. There's also a new arena, called the Black Pits. It's an enjoyable series of fights against increasingly hardened waves of enemies. That it's bundled as a separate mode, removed from the main campaign, does render it slightly irrelevant, but it's a fun extra. In all, it's a more polished version of the original, with characters that integrate well into the story and a diverting new mode. So what's the problem? For one thing, there are occasional bugs. Infrequent UI glitches cause the tool tips to glitch – a problem when you're trying to remember which icon relates to which spell. More annoyingly, the game sometimes fails to recognise the edge of areas, forcing a trek to another side of the map in order to travel somewhere new. Minor things, and fairly rare, but they take the sheen off the improvements. More important is that Overhaul Games are competing for the title of 'Enhanced Edition' with the original game's passionate community of modders. The same £13 that buys BG:EE will get you both Baldur's Gate and its sequel from GOG.com. Those games can then be patched and merged in beautiful ways through a selection of fan fixes that offer a staggering number of upgrades and restored content, all customisable to your preference. In the end it's a judgement call.